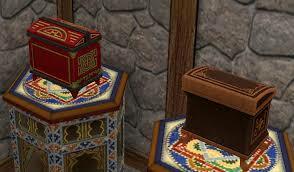 Here are 2 of the Sims 3 World Adventures treasure chests for The Sims 2. They are both found in decorative/misc. and cost 1,5000 simoleons each. Enjoy! Hello! Thank you for your conversions!!! If you can, please tell how you learned to convert Sims 3 to Sims 2. Did you use a tutorial? I can't find anything relevant in internet, and I would like to learn conversions too. It's totally up to you if you want to share your knowledge or not. Thank you anyway!